Celebrate the Jedi Master's legacy with this extraordinary Star Wars Yoda print! Magical, ethereal giclée on paper from artist Ysuneo Sanda features Master Yoda. Limited edition of only 150 pieces. Add this collectible Star Wars paper giclée to your home or office wall! Celebrate the Jedi Master's legacy with this extraordinary Star Wars Yoda print! 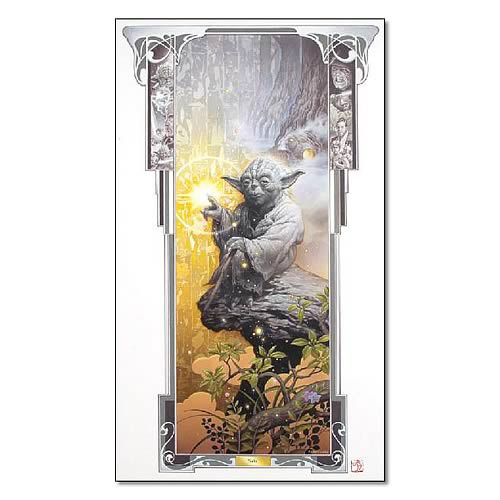 This stellar giclée on paper from artist Ysuneo Sanda features Master Yoda in a magical, ethereal work of art that measures 24-inches tall x 14-inches wide. Limited to a mere 150 hand-numbered pieces worldwide, it includes a certificate of authenticity. Add this collectible Star Wars paper giclée to your home or office wall!